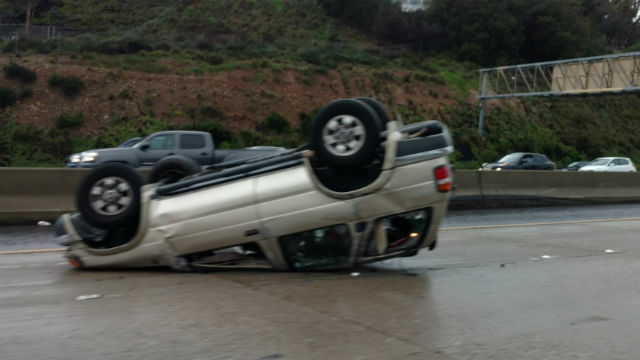 The latest in a spate of strong winter storms lashed the San Diego area Friday, toppling trees, downing utility poles and causing widespread flooding, mudslides and power outages. The unsettled atmospheric system out of the eastern Pacific — the second of three to bear down on the county this week — doused the county with steady downpours and dustings of mountain snow over the morning and afternoon, with weakening showers in the forecast through the evening hours and overnight. Among the many streets left impassible due to runoff or debris were Canfield and South Grade roads in the Palomar Mountain area, due to a rockslide; Pala Temecula Road near Arouba Road in the Pala area, where a boulder was blocking southbound traffic; Ramona Street at H Street in Ramona, which was inundated by coursing water; South Live Oak Park Road near East Alvarado Street in Fallbrook, blocked by a fallen tree; and Wildcat Canyon Road at Oak Oasis Road near Lakeside, because of large rocks in the street, authorities reported. 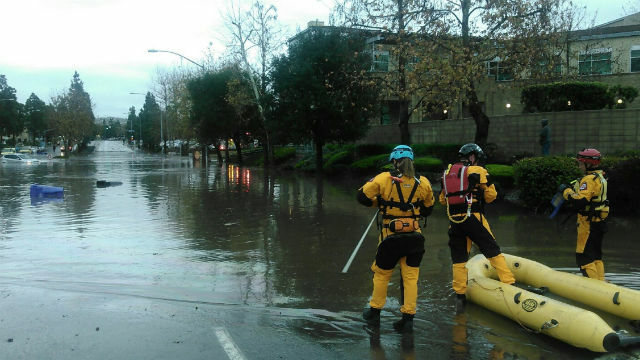 Rampant flooding also necessitated water rescues over the afternoon for people stranded in stalled and half-submerged vehicles on various roadways, including K Street in Grant Hill; National Avenue in Logan Heights; 38th Street in City Heights; at University Avenue and Alamo Drive in Rolando; and at Camino del Rio North and Ward Road in Grantville, according to San Diego Fire-Rescue officials. High winds knocked over trees across the county, sending them crashing onto parked cars and across roadways, according to public-safety officials. One of them, a roughly 30-foot-tall pepper tree, fell onto four Chula Vista Middle School students in a courtyard at the South Bay campus in the early afternoon, sending them to a hospital with minor injuries. The blustery conditions also downed utility poles and transmission cables, causing a countywide rash of outages that left roughly 35,000 homes and businesses without power as of 4 p.m., according to San Diego Gas & Electric. The downpours, meanwhile, were strong enough to break several local rainfall records for the date — in Campo, where 1.13 inches fell, exceeding the prior milestone of 0.61 of an inch, set in 1969; and in El Cajon, which got 1.05 inches, which surpassed the former Jan. 20 high mark of 0.46 of an inch, set in 1982. Over a 24-hour period ending at 5 p.m., according to the National Weather Service, the downpours left 3.21 inches of moisture on Birch Hill; 2.86 in Pine Hills; 2.84 at Lake Cuyamaca; 2.71 in Bonsall; 2.66 in Julian; 2.52 at Henshaw Dam; 2.33 at Palomar Observatory; 2.06 in Santa Ysabel; 2.31 in Descanso; 2.11 in Flinn Springs; 2.07 in Oak Grove; and 2.05 at Rainbow Camp. Other precipitation totals included 1.96 in Pine Valley; 1.93 in Barona; 1.91 on Volcan Mountain; 1.9 in Echo Dell; 1.88 in La Mesa; 1.79 in Poway; 1.76 in Escondido and Valley Center; 1.72 on Otay Mountain; 1.7 in the Lake O’Neill area of Camp Pendleton; 1.69 in Fallbrook; 1.67 in Kearny Mesa; 1.56 in Rancho Bernardo; 1.55 in Alpine and Ramona; 1.54 in Santee; 1.51 in Campo; 1.48 in Warner Springs; 1.47 at Montgomery Field; 1.25 in Point Loma; 1.23 in Oceanside and San Onofre; 1.22 on Mount Laguna; 1.2 in Carlsbad; 1.16 in Encinitas; 1.07 in Mission Valley; 1.03 in San Marcos; 1.02 in San Ysidro; 1 inch at Lindbergh Field; 0.91 in Ranchita; 0.79 at Brown Field; 0.59 in San Felipe; 0.41 in Ocotillo Wells; and 0.24 in Borrego Springs. 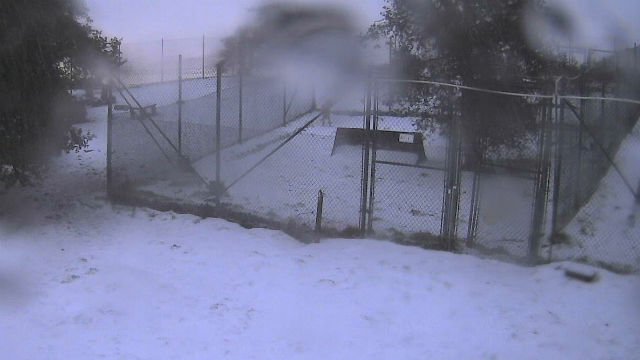 As of mid-afternoon, about an inch of snow had accumulated on some of the highest East County peaks, meteorologists reported. The inclement conditions prompted the weather service to issue a slew of warnings and advisories for various parts of the county. A winter-storm warning for the mountains will remain in effect until 6 a.m. Saturday. Elevations as low as 5,000 feet may see 5 to 10 inches of snow, while 1 to 2 feet of frozen white flakes could fall in areas from 5,500 to 6,000 feet. Additionally, a flash-flood watch for areas other than coastal, inland- valley and mountain locales will run through this evening, and a desert high- wind warning predicting sustained air currents up to 45 mph and gusts as high as 65 mph will remain in effect until 10 p.m. Saturday. Another warning indicating potential for winds of 15 to 30 mph with gusts of 45 to 60 mph along the coast and in the valleys will extend until 10 this evening. At local beaches, surf of 8 to 12 feet with sets to 16 feet is expected through Saturday, and lightning, strong rip currents and waves big enough to sweep bystanders off jetties and rocks or damage piers will be possible. A high- surf warning will remain in effect through 10 p.m. Tuesday. A break between storms is expected Saturday, followed by the final and possibly strongest in the series of storms, an unsettled system expected to arrive Sunday afternoon and deliver more significant rainfall along with additional layers of snow as low as the 4,000-foot level. The precipitation is expected to continue Monday and may linger into Tuesday. Fair weather should return by midweek, according to forecasters.